You should talk about money before jumping into it, a story in The New York Times says. You can spice it up by doing more housework, according to the Chicago Sun-Times. And this just in: Your strong commitment to it is a sign you’re trying to practice what you regularly hear preached. “It,” of course, is marriage. Marriage and its connection to religious involvement will be one of the themes highlighted Thursday during “Religious Practice and the Family,” a conference sponsored by The Heritage Foundation at the Ronald Reagan Building and International Trade Center. But you don’t have to be a sociologist to notice that marriage and parentingoften serve as an impetus, specifically for men, to get more involved with church. In a new research paper to be presented at Thursday’s conference, Wilcox examines the data and makes a further claim. His study provides substantial evidence for the idea that “the fortunes of American religion rise and fall, at least in part, with the fortunes of the intact, married family,” Wilcox says. So if the nation’s retreat from marriage continues, his work suggests, American churches will be weakened. 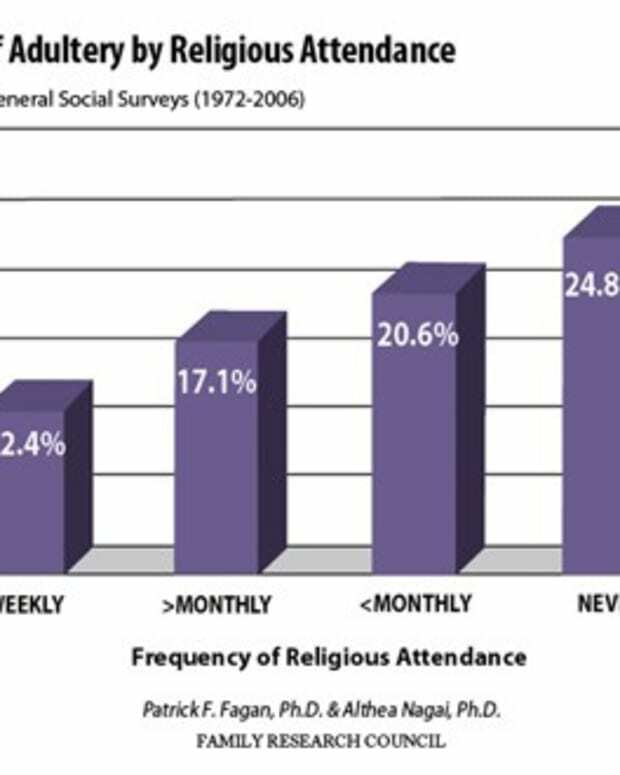 Using data from the General Social Survey, Wilcox concludes that unmarried parents are 23 percent less likely to attend church on a weekly basis than are adults who don’t have children. However, men and women who are married and have children are 62 percent more likely to attend church than unmarried peers who are childless. Join Heritage and our research partners, Child Trends and Baylor Institute for Studies of Religion, to find out more about the connection between religious practice and family life. The conference is open at no charge to anyone interested in the intersection of faith with life in the here and now. For details, and to register, go here.